LITTLE ROCK — As farmers face mounting pressure from resistant pigweed, some are turning to off-label use of an herbicide, causing damage to thousands of acres of crops, according to complaints fielded by regulators in Arkansas and Missouri. At issue is dicamba, an herbicide that offers some control of resistant pigweed. If and when the Environmental Protection Agency approves, dicamba is intended for use on Xtend cotton and soybeans. Xtend cotton and soybeans were developed by Monsanto to resist dicamba. It’s been planted for the first time on a limited number of acres in Arkansas. Tom Barber, extension weed scientist for the Division of Agriculture, said reports of injury were concentrated in northeast Arkansas, although he had received word of similar incidents in Lee, Lonoke and Phillips counties as well. “What appears to be happening is that growers planted this technology, then decided to make off-label applications of dicamba over the top for weed control prior to the product receiving a full herbicide label,” Barber said. “This new technology was approved for export to China in the early spring, and released for cotton and soybean growers to plant without a formulation of dicamba herbicide labeled for use,” he said. “Given the resistant pigweed situation we’ve had, growers who planted this technology felt like they didn’t have an option for pigweed control, and they needed to spray something. “Roundup no longer controls pigweed, and now several populations across the state are also PPO-resistant, so products containing fomesafen, such as Flexstar, are no longer an option for pigweed in soybeans,” he said. 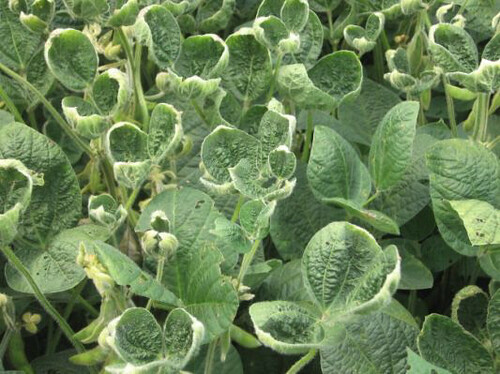 Barber said the majority of injury to non-Xtend soybeans is likely coming from drift, tank contamination and volatility – a tendency of some formulations of dicamba to vaporize after application. Once vaporized, the herbicide becomes windborne and deposited on sensitive crops away from the original target. Bob Scott, professor of weed science for the Division of Agriculture, said dicamba injury has specific, tell-tale signs in soybeans, including a “cupping” effect. Writing in the Arkansas Row Crops blog last week, Barber explained that research conducted by a University of Arkansas graduate student indicated that even small amounts of dicamba herbicide could significantly reduce soybean yields, depending on the growth stage of the plants during exposure. The first phase of the plant’s reproductive stage, commonly referred to as R1, is highly sensitive to dicamba, resulting in a 10 percent yield loss after even very low levels of exposure. Barber said soybean plants tended to show significantly less yield loss if exposed to the herbicide during vegetative stages. Susie Nichols, Agri Division Manager of the Pest Division at the Arkansas State Plant Board, said her office currently has about two dozen case files open on what are believed to be dicamba drift in the state’s northeastern counties. There have been additional informal complaints, she said, although many growers are unwilling to file formal complaints. Nichols said that although her department currently has about 200 case files open statewide, for more than 20 complaints to be based on one specific herbicide is unusual. Sarah Alsager, spokesman for the Missouri Department of Agriculture, said the department’s pesticide program had received about 100 complaints related to soybean injury and pesticide drift in the state’s southeastern Bootheel area since June 22. Earlier, in May, the department had issued a public reminder that while dicamba was permissible to use in burndown applications to control broadleaf weeds, there was still no label for use on in-season cotton, soybeans or other crops. Ray Benson, staff chair for the Mississippi County Cooperative Extension Service office, said most of the soybean injury he has seen in his county is concentrated in the northwestern portion of the county, along the Missouri border. He estimated that 4,000-6,000 acres of soybeans in the county have already suffered some degree of yield loss due to drift. In 2015, Mississippi County growers harvested approximately 294,900 acres of soybeans, according to data from the U.S. Department of Agriculture. Both Benson and Barber recalled that when Monsanto released its glyphosate-resistant Roundup Ready seed technologies in the late 1990s, many growers adopted the crop technology after suffering similar injuries to crops caused by herbicide drift. “It all happened very quickly,” Scott said. “There was a lot of Roundup drift and problems with non-Roundup Ready crops, so quite quickly, everyone adopted the technology. Jeremy Ross, extension soybean agronomist for the Division of Agriculture, estimated that 150,000-200,000 acres of Xtend soybeans are planted throughout the Delta region, in part because the technology is new, and in part because the technology doesn’t yet have export approval from the European Union, causing many grain buyers to decline purchasing soybeans grown from the genetically modified seed. Benson said that when it comes to complaints about damage from pesticide drift, growers are directed to contact the state plant board. “The $1,000 [fine] doesn’t seem to be deterring anyone,” she said. For its part, Monsanto has reiterated that proper pesticide use is the responsibility of the grower. “Prior to the season, during the season, and still, we’ve implemented a robust communication plan, where we’ve reached out ... to remind licensing partners, growers, dealers, members of the industry, that no dicamba products are currently approved for in-crop use, with Xtend soybeans or Xtendflex cotton,” said Kyel Richard, a Monsanto spokesman. Richard said that while dicamba resistance was one selling point of the Xtend technology, it was never intended to single-handedly supersede other weed management practices. Barber said that regardless of crop damage or yield loss, growers will still need to concentrate on maximizing yields to the best of their ability. “Growers will have to continue to manage their crop, even if they’ve suffered from this kind of drift,” Barber said. “We’ve got to continue to grow out the soybean and see what we get. There’s nothing else we could do — there’s no magic potion to spray to make it recover. It’s just a ‘wait and see’ kind of deal. For more information about pesticide use, contact your county extension office, or visit www.uaex.edu or http://Arkansascrops.com.